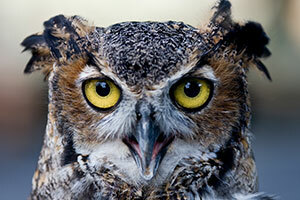 The piercing eyes of a great horned owl. While the burrowing owl might be the most well known owl in southern Florida, it is certainly not alone in the area. The great horned owl is prevalent here as well, a species which grows much larger than the burrowing owl, and is in fact the second largest species of owl found in North America, smaller only than the snowy owl. Perhaps due to its large size and majestic appearance, the great horned owl has always been greatly respected and admired and was even once worshipped by many Native American tribes, who considered them to be powerful, yet friendly spirits despite their oftentimes solemn and frightening calls. The average adult great horned owl can reach heights of almost 2 feet, weights of over 3 lbs, and wingspans of over 4 feet across, though they have been reported much larger. Although great horned owls can vary greatly in their overall coloring, they generally tend to be colored to blend into their surroundings, and have even earned the nickname of “tiger owls.” This nickname may also be due to their piercing, yellow eyes, which are among the largest, most powerful, and fear-inducing eyes that can be found within the animal kingdom. The great horned owl is considered to be one of the most adaptable of all bird species in the entire world, and is the second most widely distributed owl species found throughout both North and South America. It may seem odd that the same species of bird that could be so comfortable in subarctic areas of Canada could also be comfortable in the tropical habitats of the Florida Everglades, but the great horned owl has managed successfully to do just that. The abundance of the great horned owl throughout varying locales seems to have less to do with a preference in temperature or humidity, and more to do with a preference for fragmented landscapes. While they have been found to live in a range of different types of trees and foliage, they seem to steer clear of dense areas of trees and vast woodlands. On the other hand, they also seem absent from deserts and large prairies without any forest cover at all. Great horned owls are most prevalent in areas where there is a mixture of both forest cover and open grasslands, where they are free to hunt openly but also have plenty of shelter available when needed. The great horned owl is not considered a threatened species, and is even so common in some areas of the Americas that it is instead considered a pest. With virtually no natural predators, the great horned owl’s greatest threats are humans and human-made structures, and surprisingly, other adult great horned owls. To see these beautiful creatures for yourself and to gain an important understanding and appreciation for them, take an Everglades tour by airboat. With an Everglades airboat ride, not only will you have the chance to possibly observe great horned owls during rare daytime hunts, but you will have the chance to see dozens of other fascinating Florida wildlife natives as well. Previous story Why Do Cypress Trees Have Knees?